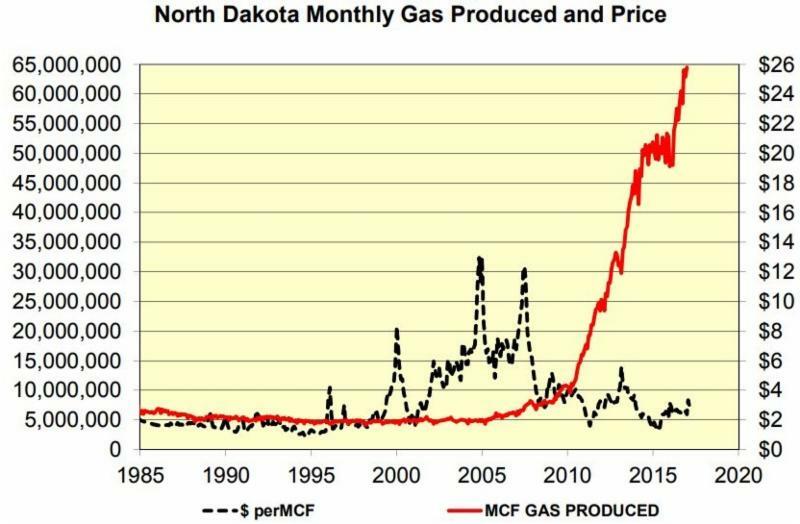 Market analysts focus attention on oil production, so almost unnoticed was the fact that North Dakota established another new-all time high for natural gas production in February. 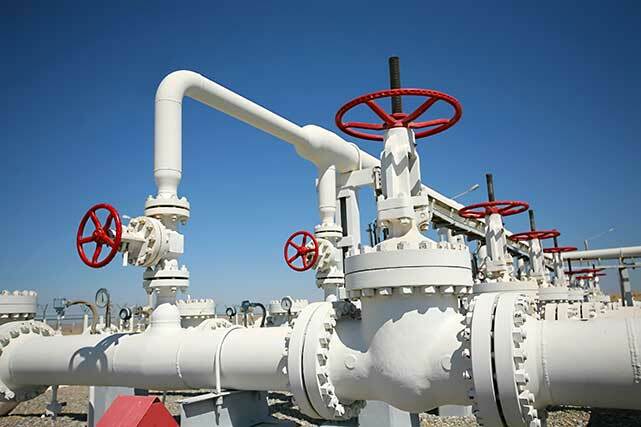 The state produced nearly 59 billion cubic feet of natural gas in February, or 2.102 Bcf per day, according to statistics compiled by the Department of Mineral Resources. The previous record was 2.096 Bcf/day set in December 2017. The increase is being driven by better production technology and growing gas-to-oil ratios, according to Justin Kringstad, director of the ND Pipeline Authority. Historically, he said the ratio has been close to one, meaning 1,000 cubic feet of gas for each barrel of oil produced, but it’s now closer to a 2:1 ratio. “The expectations are that over time in the coming decade, we’re going to shift from this lower gas-oil ratio to a higher ratio,” Kringstad said. Click here to see Kringstad’s slide presentation to the ND Industrial Commission. Nearly half of the state’s production is coming from McKenzie County, which produced 28.3 Bcf in the month of February. Williams County was a distant second with just over 10 Bcf. Click here to see a chart of county-by-county natural gas production numbers. Oil production volumes dipped slightly in February, mainly due to winter-related difficulties. Click here to see DMR Director Lynn Helms’ Directors Cut. Click here for Renée Jean's story about the production numbers in the Williston Herald. 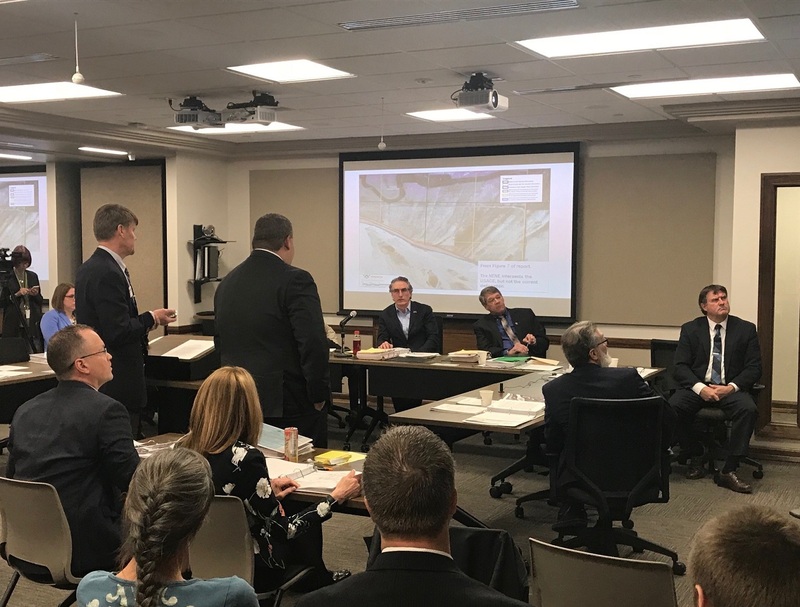 The North Dakota Industrial Commission approved minor revisions to the state’s natural gas capture rules this week, leaving in place current and future gas capture targets. 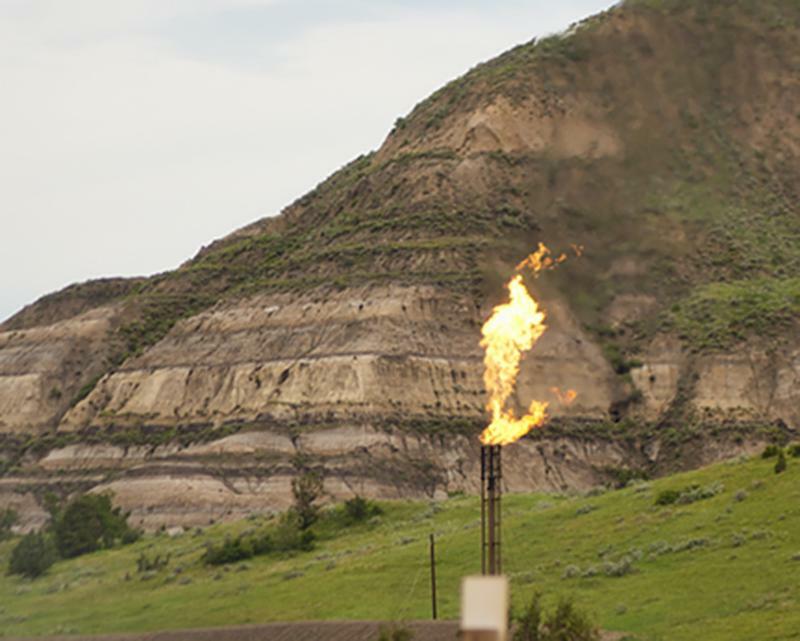 Producers are currently required to capture 85 percent of gas produced at the wellhead, a figure that will increase to 88 percent on November 1. The targets will not change, but the NDIC did vote to grant some flexibility to producers who are challenged by highly variable rates of initial gas production at modern multi-well pads, and the economics of connecting wells in remote locations. DMR Director Lynn Helms provided an overview of suggestions developed by the ND Petroleum Council’s Gas Capture Task Force. One of the ideas approved by the NDIC will allow producers to deduct the first 60 days of initial production from monthly volume calculations. Helms said the change will give producers time to determine the right size of pipe to capture the gas. Helms said DMR will focus its enforcement on producers that aren’t doing a good job of gas capture. NDIC members received an update on natural gas production from Justin Kringstad of the ND Pipeline Authority. His presentation showed that more than 99% of wells are now connected to a natural gas gathering line, and the average time for establishing a connection is down to about two weeks. Kari Cutting, vice-president of the ND Petroleum Council, said the numbers reflect efforts by the industry to meet and exceed the gas capture targets. Click here to listen to Cutting’s comments. Cutting made her comments during an interview on the radio program Energy Matters. Click here and advance to the 3:50 mark to listen to the full interview. Click here for a story from KFYR-TV. 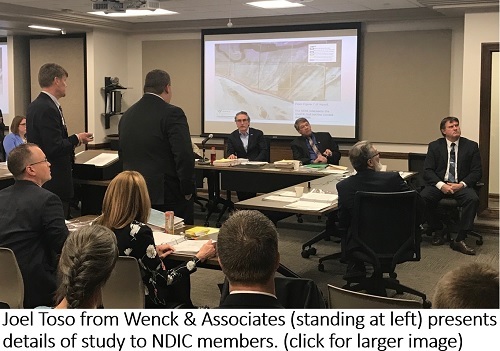 Members of the ND Industrial Commission heard a presentation this week from Wenck and Associates, describing the results of the newest Lake Bed Minerals survey. Wenck’s project manager Joel Toso said the firm examined aerial photos, topographical maps, river flow data, and newly-discovered historical cross-section topography completed by the U.S. Army Corps of Engineers. The survey was required by SB 2134 enacted by the 2017 Legislature. The legislation was intended to restore mineral rights lost by property owners when their land was inundated by the completion of the Garrison Dam. The study was aimed at determining the ordinary high water mark of the Missouri River as it existed before the dam was built. The Department of Mineral Resources will accept comments on the new survey over the next 60 days, during which time mineral owners will compare it to a 1950s-era Corps survey and a 2009 survey completed by the Department of Trust Lands. The NDIC will conduct a June 26 hearing on the new survey at the ND Heritage Center. Click here to see the Ordinary High Water Mark report. Click here to see Wenck’s Powerpoint presentation. Click here to read Amy Dalrymple's story. North Dakota oil and gas regulators will get together at a meeting next week with officials from the Bureau of Indian Affairs and the Mandan-Hidatsa-Arikara Nation to discuss ways to reduce natural gas flaring on the Ft. Berthold Reservation. Rates of gas capture on the reservation have improved in recent months, but still remain above the state as a whole. DMR Director Lynn Helms said the April 25 meeting will bring all the players to the table to discuss what needs to be done. Helms gives credit for setting up the meeting to Scott Davis, Executive Director of the North Dakota Indian Affairs Commission. The meeting will be held at United Tribes Technical College in Bismarck. The North Dakota Petroleum Council sent a reminder to its members this week, urging them to be respectful of landowners’ property during the soggy Spring thaw. 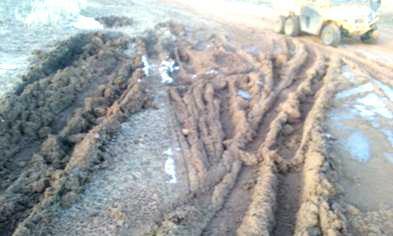 NDPC President Ron Ness said he was notified this week of incidents in which trucks turned around on private property, damaging yards and leaving behind deep ruts. In a message to his members, Ness said companies have worked hard to build and maintain positive relationships with landowners, so it’s unfortunate to receive reports of damage like that which occurred this week. Ness said people understand new hires can get lost on rural roads, but they must be considerate of landowners and their property. He urged companies to make sure employees have the right directions to their destinations, abide by weight limits for roads and bridges, and try to find an approach if they get lost and have to turn around. He also said if property is damaged, companies should find the landowner and make it right. Meridian Energy has signed a letter of intent with a specialty engineering, procurement and construction solutions provider based in Houston to complete a front-end engineering and design study for the proposed Davis Refinery near Belfield. Meridian officials say they're confident the North Dakota Department of Health will issue the final permit for construction of the refinery, though no date has been set for that permit to be granted. The Meridian news release is here. Fifteen North Dakota law enforcement officers graduated this week from the state's Drug Evaluation and Classification program. The program trains officers and other public safety officials to detect and identify people who are impaired by alcohol or drugs. Western Dakota graduates include Dickinson police officer Ian Wise, Minot police officer Joshua Noyes, McKenzie County Deputy Sheriff Kyle Giersdorf, and Williston police officers Jacob Koehn and Craig Ware. The officers completed a three-phase process with over 130 hours of training. With the new graduates, the state now has a total of 75 certified drug recognition experts. The ability to recognize impairment and remove impaired drivers from the roads is one of the key parts of the state's goal of zero motor vehicle fatalities. With oil prices climbing close to $70/barrel, North Dakota has a tremendous opportunity to grow the industry. But it takes people to make it happen, and the state currently has a lot more job openings than people to fill them. The Williston office of ND Job Service has more than 2,000 openings alone, and will be conducting job fairs next Wednesday in Williston and Thursday in Watford City. Job Service manager Cindy Sanford said there will be dozens of employers at the job fairs, and a wide range of positions to fill. Sanford said the current hiring gap is partly due to the fact the current crop of job seekers is lacking skills that employers require. Sanford made her comments during an interview on the radio program Energy Matters. Click here and advance to the 1:25 mark to hear the full interview. Williston’s job fair will be held April 25 from 3:00-7:00 pm at the Raymond Family Center. The Watford City job fair runs from 11:00 am to 3:00 pm on April 26 at the Rough Rider Center. Members of the ND Legislature’s Higher Education Committee also heard testimony this week from Dr. John Miller, president of Williston State College, who described efforts of the state’s community colleges to meet workforce needs. Click here to view Dr. Miller’s presentation. Click here for Renée Jean's story about the worker shortage in the Williston Herald. Williams County Commissioner Wayne Aberle was re-elected this week to serve another year as president of the LoadPass Permits advisory committee, and Mountrail County Commissioner Trudy Ruland, a WDEA board member, was chosen vice-president. Also elected to at-large positions on the advisory committee were Stark County Road Superintendent Al Heiser and McKenzie County Deputy Sheriff Matt Johansen. The fifth member of the advisory committee will be an ex-offico member of the WDEA Executive Committee. That individual will be named when the board meets Tuesday in Dickinson. LoadPass Permits is the uniform truck permitting system operated by WDEA to manage the movement of oversize trucks in the oil-producing region. 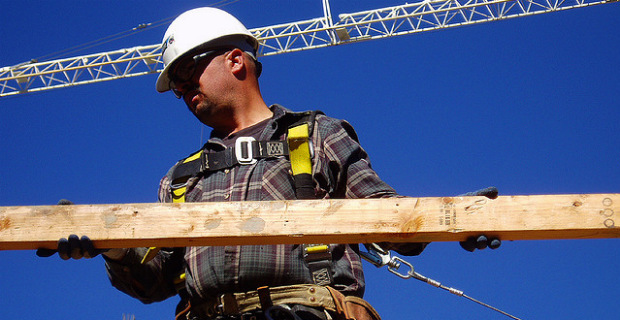 The five-member advisory board was established by recent changes to LoadPass bylaws to provide continuity between the permit system committee and WDEA’s Executive Committee. The bylaws provide the opportunity for representation from counties outside the oil-producing region. WDEA staff are actively marketing the system to other counties, several of which have recently voted to join. Click here to learn more about LoadPass. The American Lung Association ranked the quality of North Dakota's air low in its annual report, but it has nothing to do with industry. 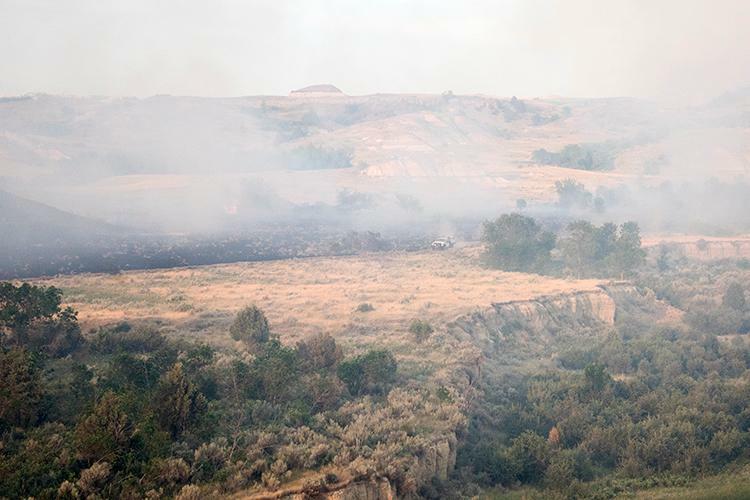 The 2018 report says smoke from western U.S. and Canadian wildfires lowered the state's air quality. Burke and Dunn Counties both got an "F" grade. Burleigh, McKenzie, Oliver and Williams counties got "D" grades. The county breakdown is here. The entire report can be found here.